Fruit Chews Has A New Look! Fruit Rolls Are Making A Change! New look with the same great taste! 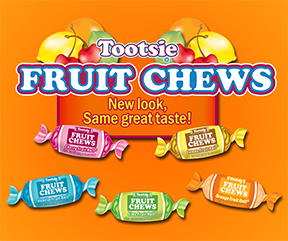 Tootsie Fruit Rolls will now be called Fruit Chews, bursting with the same 5 fruity flavors; Cherry, lemon, lime, orange and vanilla!